It is said that one in every five women over the age of 30 years has a uterine fibroid. It is one of the most common diseases of the uterus. However, the majority of women who have fibroid masses do not know that they have it, because most often, it causes no symptoms at all. Some people say that uterine fibroids are not a major health concern and that it can be left alone. Others agree that fibroids can turn into a much more dangerous disease, and immediate surgical removal of it is necessary. To uncover the myth and understand the reality about uterine fibroids, we conducted a study among 15 women aged 30 to 40 years who have not consulted an ob-gyn for several years. We brought them to an ob-gyn for diagnosis and found five of them suffering from uterine fibroids. Five fibroids were also found in different locations of the uterus from each one of them. We thought of having them undergo immediate surgery, but the physicians decided to observe and monitor them closely at first. At one time, I heard a story of a woman who experienced heavy bleeding because of uterine fibroids. She underwent surgery and was told that the fibroids removed were the size of marbles. Treatment for uterine fibroids is not only determined by the size and number of fibroids, but will also depend on their location and symptoms. 1. Subserosal Fibroids – fibroids that grow under the outer muscle layer of the uterus. 2. 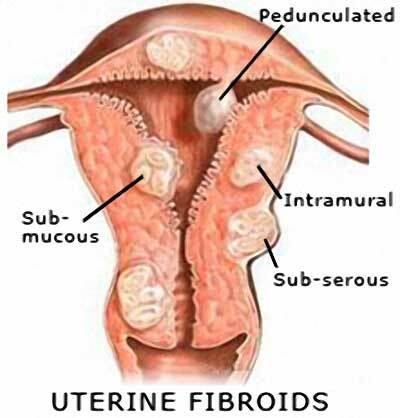 Intramural Fibroids – fibroids that grow within the muscle layer of the uterus. Subserosal or intramural fibroids are fibroids that commonly cause no symptoms unless they are very large. If bulk symptoms such as constipation, pelvic pain, and lower back pain do appear, then you may need to seek medical attention as soon as possible. 3. Submucosal or Intracavitary Fibroids – fibroids that grow in the central portion of the uterus, just under the lining of the uterine cavity, or sometimes located entirely in the cavity of the uterus. The submucosal or intracavitary fibroids are mostly responsible for the heavy menstrual bleeding among women suffering from uterine fibroids. As they spread and grow larger, severe bleeding and pain may occur, which can increase the risk of death if left untreated. They can block the fallopian tube, thereby preventing the sperm from fertilizing the egg. Large submucosal fibroids will increase the distance the sperms have to travel as they can increase the size of the cavity of the uterus. Multiple and large submucosal uterine fibroids can diminish or impair the blood supply to the uterine arteries. In other words, the entire anatomy and structure of the uterus will be disturbed. The two common treatments for uterine fibroids are surgery and medication. Medications, however, cannot cure uterine fibroids permanently. They can only provide temporary relief from symptoms or reduce the size of the fibroids. So far, surgery is considered the best treatment option especially for submucosal uterine fibroids. One type of surgical procedure is called "myomectomy", which is performed to remove the fibroids via an abdominal incision. A relatively safe procedure, known as "hysteroscopy" (surgical procedure utilizing an endoscope), is often performed to remove the fibroids without needing an abdominal incision. Should the fibroids get very large, "hysterectomy" (surgical removal of the uterus) still remains the only permanent solution for uterine fibroids. Uterine Sarcoma – Uterine Cancer? Rapid or unexpected growth, such as enlargement of fibroid after menopause in a short period of time, might indicate a cancer or malignant tumor (sarcoma). It is quite hard to differentiate a malignant uterine sarcoma from the common uterine fibroids because they share the same symptoms. It is important to consult your physician to determine if you're having symptoms that might be caused by cancer in the uterus. The PYRO-ENERGEN electrostatic therapy machine is very effective for uterine sarcoma or cancer. Daily treatment with PYRO-ENERGEN is good to prevent cancer and viral diseases, and to maintain good health.